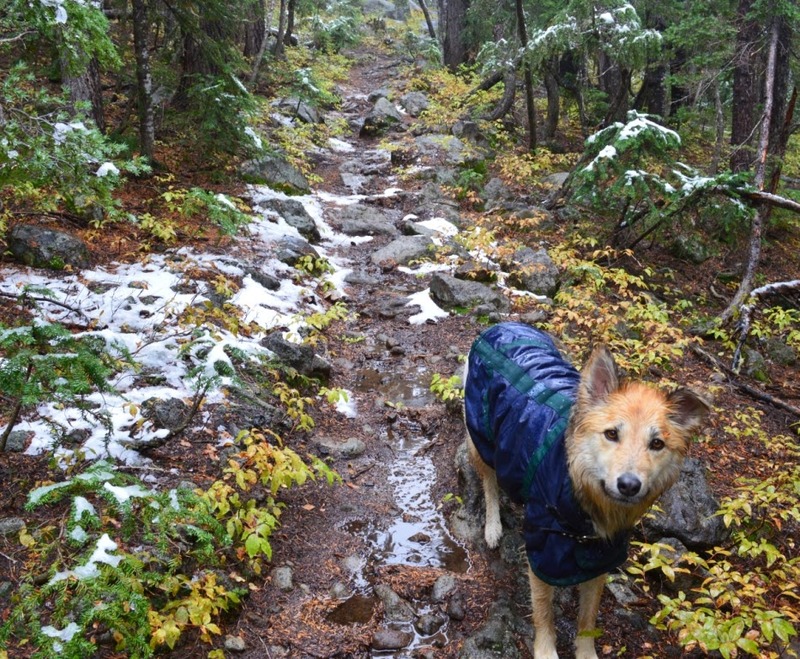 Fair weather hiker? 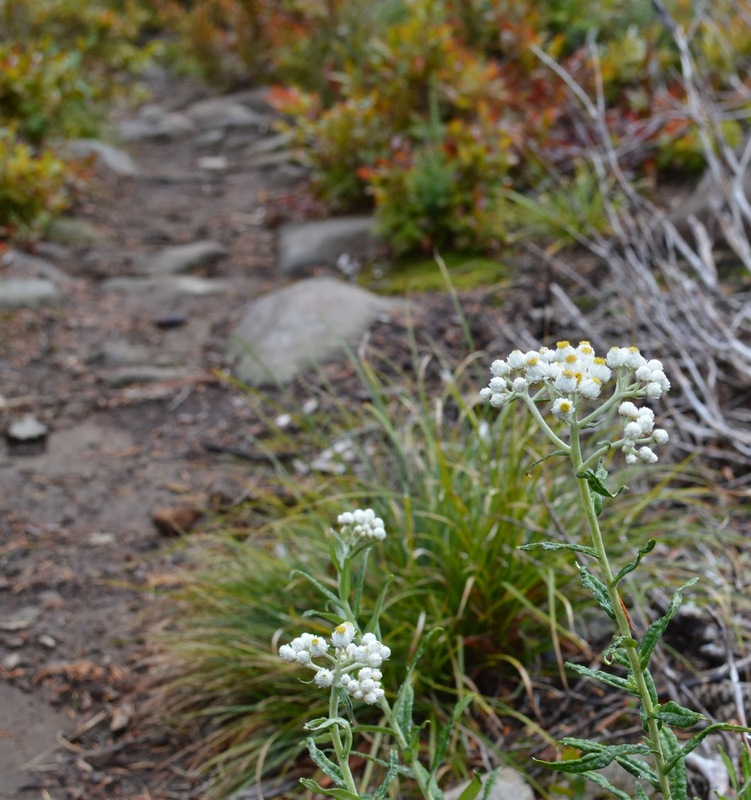 You'll need to stay out of the high Cascades in the fall. BEAUTIFUL lakelet in the middle of the recovering burn area. For this trip, Nico, our loyal trail dog led the way on a 20+ mile loop in and around the Warm Springs Indian Reservation, Mt. 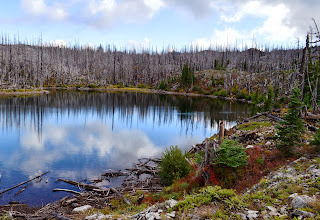 Hood National Forest, dozens of lakes-many of them sacred to the tribe, and the summit of the highest point in Wasco County.This is one of the most isolated areas of the Oregon Cascades. The drive from any state highway is over 20 miles. I wanted to check off the highest point in Wasco County, but also wanted to investigate the Dark Lakes. 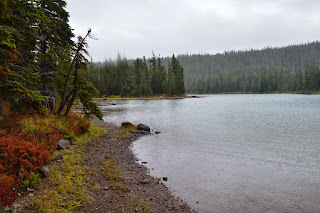 Known as a sacred area to the tribe, The Dark Lakes region lies a few miles east of Olallie Lake. As a visitor, it is important to respect the tribal lands and not camp at any of the Dark Lakes. On the map you can see a faint diagonal red line from the top of Olallie Butte to the top of Campbell Butte. This is known as the Campbell Line. On this hike, you can find an interesting artifact reflecting the battle of the preservation of tribal lands. The original Warm Springs Reservation was delineated by the Campbell Line surveyed in 1871. When the tribes complained that the line was surveyed wrong as per their agreement (shorting them some 80,000 acres), the U.S. Government remeasured in 1886 to the present boundary to the west. It took the U.S. some 80+ years to process the request. In the early 1970's the line was finally moved. Look for a small line of wire along the trail which I've been told was an attempt to mark original Campbell Line. 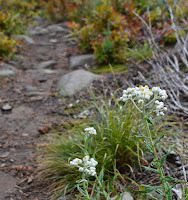 Jumping off from the northwest side of Olallie Butte at the PCT, we climbed quickly. The butte is a conical, dormant shield volcano which has over 2,000 feet of prominence. 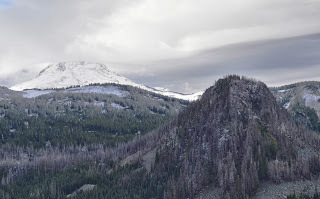 The rain turned to snow, certainly a September surprise given our elevation below 8,000 feet. We camped right near the Wasco County high point. Continuing our trip south, we were cross country for the next day breaking thru' brush down the south face of the butte and into the Dark Lakes area. 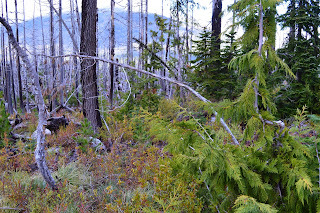 Climbing south we came upon some cedar trees that were repopulating the burn area. We did not see any other cedars anywhere in this region so it was quite striking to see them growing here. Cedar trees with spruces with Olallie Butte to the north. The starkness of this area still recovering from fire was magical. Silver towers of dead conifers filled the viewshed as gray fall clouds wrung out a steady shower on and off. Continuing south of the burn area, we reach Horseshoe Lake as we straddle the line between the Reservation and the National Forest. The car-camp lake, reachable by long drives on rocky roads, is vacant and has a sad worn look. Trash from the season is fairly abundant and the rain makes it all seem more dim. I strike up the stove, make biscuits, and pickup trash to boost my mood. Day 3 was a day trip up to Park Butte. The idea was to get a magnificent view of Mt. Jefferson and get high enough to be able to text my family for the first time in a few days. One glimpse of Jefferson popped thru' the clouds for a moment. Day 4 was a long slog out in the rain for about 8 miles. It was so cold and wet, that you just have to smile. I kept laughing about how ridiculous it was to be out there. After 4 days of seeing no one, I started to come across a high Cascades ultra-marathon race. The 50 or runners had something in common with me. We both thought the other was crazy for being out there. Really, does she need to speak? We know what she's thinking. 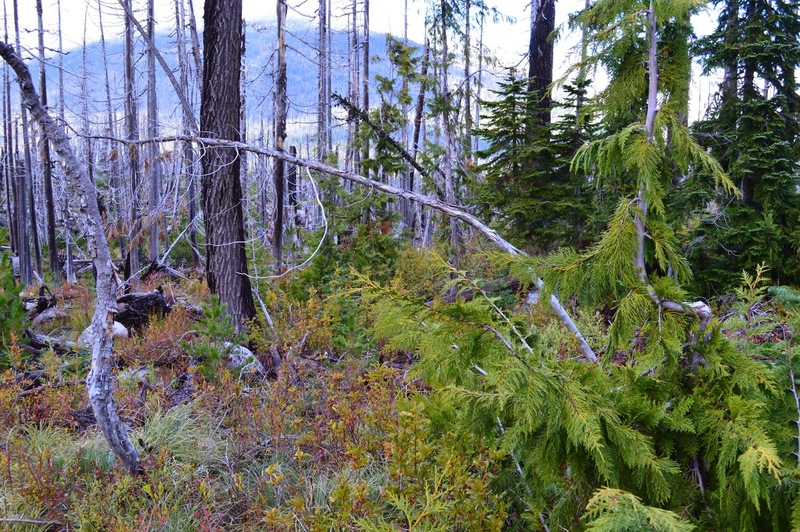 Hike Rating: Difficult, heavy burn area recovering, strenuous hiking and rocky terrain. There are two ways to access the TH that lies on the NNE side of the Butte. One is about 30 miles from Detroit is dicey and was pretty tough on my Subaru. Allow almost 2 hours to get to the TH. The other is from the east from Madras and is shorter, but WAY more of an adventure. I did it in my Subaru, but I'd recommend a high clearance truck. Take Hwy 26 west (headed in a northerly direction) thru' Warm Springs. After you come out of the canyon, look for County Line Road aka Blue Lake Road aka P-600. Follow the road for about 5.8 miles and turn left at triangle intersection onto Old Mill Road aka B-130. Follow for 5 miles until you cross Mill Creek. Interesting stop here to investigate the Old Mill Camp which has many ruins of out buildings and mill equipment. Turn left after Mill Creek onto Blue Lake Road. In 2.5 miles, turn left onto B-240 crossing under powerlines you've been traveling under (just before you cross under the another set of powerlines). Follow signs for 7.6 miles and you reach Blue Lake-a rarely used beautiful lake in the northeast shadow of Ollalie Butte. Follow the road on the north side of the lake. In about 1 mile, you have a creek crossing that is sketchy in early season. One mile more and you intersect NF-4220 where you'll find the TH. Total travel-23.25 miles and about an hour from Hwy 26.